Shep has received an unusual request. I don't lead a normal life so really there is nothing unusual about an unusual request. It is 80 pages, 200 plus photos black and white and colour covering the last 3 sales held at Bellingham mart with a brief history. Retailing at £17.00 softcover, £24.00 hardcover. Back Cover reads: "Bellingham, Northumberland has been the home of livestock auctions since the 1860's. However the foot and mouth outbreak in 2001 and the subsequent livestock regulations slowly brought about the demise of Bellingham Mart. October 2004 saw the last livestock to be sold by auction in Bellingham. This book is a photographic record of that last sale and the two sales held in 2003. A look back through history." Flap reads: "Feet traipsed the pens and alleyways of Bellingham sales for over 100 years. The auction in it's many formats survived two world wars, afforestation throughout the Borders, the swamping of the Upper North Tyne by Kielder Reservoir and a decline in stocking rates due to Farm Stewardships. Hexham and Northern marts reproduced the 'Bellingham' ring at their Hexham premises and life moved on. Memories hold strong. Tales will be told for many years to come and hopefully this photographic essay will ensure Bellingham Auction mart and all it stood for will never be forgotten. Back flap reads: Helen Brown has lived and worked near to Bellingham in the Northumberland National park for the past 27 years and is a shepherd, in recent times a contract shepherd, who carries a camera whenever she can. She managed to record the last sale at Bellingham Mart even though it is unnatural for her to point the camera at people, preferring to catch the flora and fauna that surrounds her every day life. "This wonderful collection has been three years in the making. Taking the pictures was the easy part, given the wealth of subjects available and the affinity I have with the mart, researching the history and editing them proved to be the hard part. The photos were taken because Bellingham mart has always held a place in my heart, the people and livestock, the atmosphere and the conditions made it a very special place. I hope that this affection shines through the pictures and is shared by many farmers. Uunfortunately, due partly to foot and mouth and increasing drifts of red tape the mart became unviable and we lost it. I have tried to capture the personality of the place and show the farmers and mart workers as the characters they were. I have included everything from birds eye views of the pens to the cobwebs in the mornings covered in dew. Many people have said since they would love to have a collection of my photos, therefore I've produced this book. It is self funded, digitally printed and self published with me having purchased 250 copies"
A friend adds: "The Last Mart has been self-published by Helen Brown of Tarset, Northumberland. Helen is a shepherd and is well-known and well liked in the farming community. 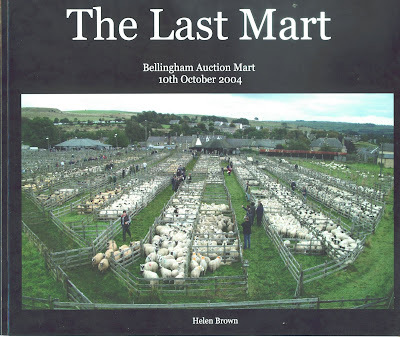 The Last Mart is a triumph for Helen - a busy shepherd working in remote areas at the height of the summer sheep season who uses an American company to self-publish a book, printed in the Netherlands, about the past in this corner of Northumberland." The poignant, last day of the North Tyne’s historic sheep mart is captured for posterity in a moving production on DVD and launched on Saturday 29 August. 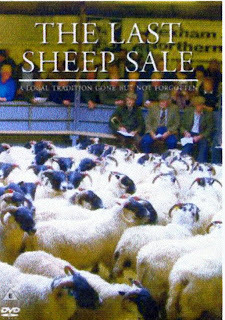 It was the end of an era for the hill farmers of the North Tyne and Redesdale, but fortunately the last ever sheep sale at the historic mart in the market town of Bellingham, Northumberland was captured on film for posterity for Northumberland National Park in 2004. On Saturday 29th August 2009, a new DVD using this footage becomes available to the public, with the moving last moments of an event that has taken place for hundreds, maybe a thousand years. “The Last Sheep Sale – a local tradition gone but not forgotten” will be launched by Northumberland National Park and the Bellingham Heritage Centre at the town’s annual agricultural show next Saturday. From the same stable as “The Last Horsemen” and “The Last Fishermen”, the sensitively-produced DVD lets the voices of the community speak for themselves. They talk about the mart’s importance for the continuity of a traditional rural way of life; for the memories of generations, and above all for its vital role as a social centre for an industry that is both remote and solitary. In its heyday, Bellingham Mart’s second lamb sale was one of, if not the largest, sale days in all of England, with lambs and sheep from this centre sold as far afield as the South Coast. The closure of the mart in 2004 was a great blow to farmers and traders across a wide area of Northumberland. It not only meant that farmers and livestock breeders have to travel further to sell their animals – to Hexham or Wooler, but the town lost a lively event that brought welcome business to local shops, cafés and bars. It was the end too of a great social gathering where people met friends from far and wide. The Bellingham Mart closed because it was affected by reduced income following the outbreak of foot-and-mouth disease in 2001, and the cost of complying with new government regulations was beyond its means. Bellingham is an ancient settlement located at a key point in the great network of drove roads between Scotland and England that were once vital routes in the process of fattening and selling cattle and sheep, and it is likely that the Bellingham Mart grew out of this old cross-border trade. Production of the DVD was made possible by sponsorship from Northumberland National Park Authority and a donation from Hexham and Northern Marts. Well I read your piece! But I knew about it already from the Heritage Centre. I'm loking forward to seeing both. Someone does read this stuff then! Good old Heritage centre.......... hope you managed to see them both at the show today.